We've reviewed the design doc for your new game code-named Sudoku, and we're giving you the green light to build the alpha. We've made just a few revisions to the spec (see attached annotated picture). Frankly, we're a little baffled that your original design was so... simple. I'm sure we all recognize that our target market demands a much more media-rich, interactive, high-action experience. Love the whole grid thing, though. You do know that the iPod video was actually produced by Microsoft themselves, right? "Where are the guns?" Heh, love it! I'm with Brad. This posting is too much of a knock-off of the iPod packaging video that came out recently. Brad: that definitely makes the video more interesting... on a lot of levels. Microsoft is touring with WinFX at the moment. Showcasing... yup, a Sudoko game with multiplayer functionality and fireworks of visual cues. This post made me laugh, but it was definitely a rather wry laugh, since there is likely to be a whole heap of truth in what you say. As a sudoku addict, I would have to say: it ain't broke - don't fix it! When it comes time to unwind there's nothing better than a cup of coffee and a sudoku in the sunshine. Of course, the sunshine makes it difficult to play onscreen, so I tend to opt for hard copy, pencil and eraser. FYI, Microsoft has already released (on MSDN) a version of Sudoku and I believe it will be bundled on future Tablet PC versions or at least on the Origami/UMPC editions. And despite what you might think, it's actually very slick. Comes with full source code as well. Best Sudoku programming I've found is at http://www.ironsudoku.com. Usability++. it lets me toggl the board to shapes, flags or digits. Or you can also create a legend from any traditional sudoku puzzle and transcribe the board yourself. Being the nerd I am I actually kept puzzle times on a mini excel sheet doing the same puzzles via three different methods- there were interesting, consistent results. I won't spoil it- you gotta try yourself. On the topic of "simple", I must admit I've speculated on enhancements of sodoku into the third dimension... Talk about unworkable!!! You don't seriously think Microsoft would come up with names like that, do you? They are way too short and fun-sounding. NOTHING is a good product for Windows unless it allows "skins". Never mind how useless it is. Have you played the Washington Post's online version of Sudoku? It's great. I'm pretty passionate about it I guess. It does have sound and animations though.... but the effects make it fun and give meaningful feedback instead of being fluff. I showed it to a geek in my office. He asked: Whare is the humor? > "Number Gathering Calculation Grid Foundation Server"
No, they'd name it ActiveNumbers. I don't like Sudoku because I find it antisocial. With crossword puzzles, you can ask your neighbor, "What's the capital of Topeka?" etc., i.e., you can involve someone else, start a little chat. Where's that with Sudoku? Nowhere. 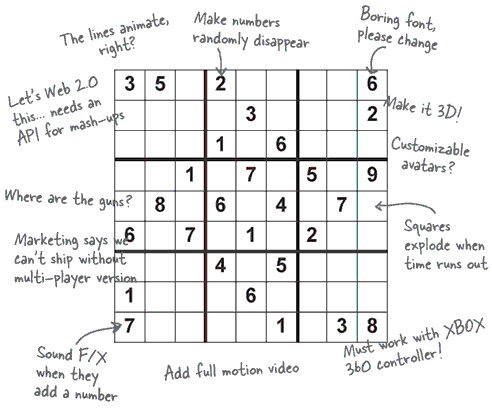 Well, Sudoku is a name for Latin Squares (developed by Howard Garns), except it has a few guidelines as to how many numbers the "player" can start with and where they can go. But thinking of it as Latin Squares helps to emphasize what the real puzzle is. It's not one square with 28 numbers you need to complete, it's finding the square the most given numbers that have two solutions. Thats where the fun begins.